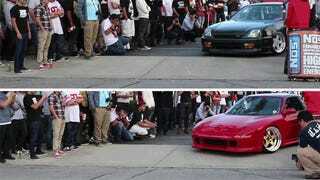 Stanced Cars Vs. The World's Tiniest Driveway: Who Will Win? It might just be the most bizarre car competition I've seen, were it clear exactly what the competition was: it's two stanced car clubs competing simultaneously for who is the best and also worst at driving up and down the slightest of inclines. If you can't stand the sound of oil pans crunching and grinding on the pavement, look away.